The idea of parallel circuits or traps in a dipole antenna to obtain more than one resonance was first invented by G8KW. He was assigned to the Royal Signals during the Second World War. His idea was applied to military transmitting installations. Since a publication of W3DZZ in a ham magazine the smart antenna system is known as W3DZZ antenna. A parallel resonant circuit with coil and capacitance acts as an insulator. 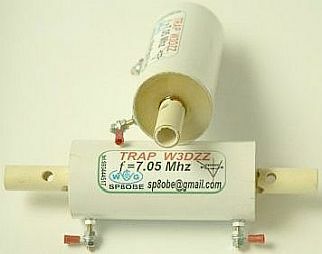 The 7 - 7.2 MHz resonance is a high impedance for 40 m and that creates an insulation between the traps. The ends of the antenna has a negligible influence on 40 m. In practice it appears that the lenght between the traps is not too critical because the parallel circuit draws, as it were, the antenna part between the traps in resonance. 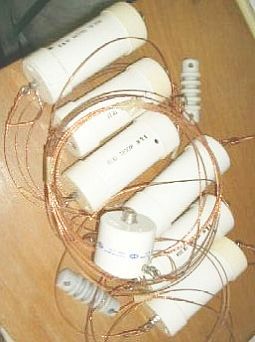 On 80 m the capacitance's share is negligible and the coil works as inductive extension so that the antenna works on the lower frequency. By extending or shortening the outer parts, one can obtain a resonance of your choice in the 80 m band. 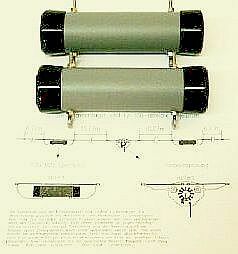 Often there are also resonances on the 10, 15 and 20 m bands due to an (accidental) shortening effect of the capacitors. With these three bands the SWR can reach a SWR = 2.5. An advantage of this antenna is that for 20, 40 and 80 m the point with the most current and maximum radiation is exactly in the middle and not somewhere in the feeder. In terms of SWR, a G8KW/W3DZZ antenna is strongly influenced by suspension height and local conditions. Therefore, at a different location or suspension height it may be necessary to trim the length of both halves to obtain a low SWR on one or more bands. If a stretched (in-line) antenna is used in another form, for example inverted V, the capacitance of the ends to earth increases. The antenna (for example a G5RV or FD4) becomes electrically longer and is strictly speaking no longer the same as the original. There is a reasonable chance that another SWR is obtained on some bands. A 7 MHz wave trap can hardly be adjusted properly without a suitable device such as a dipmeter. I made many traps and the one assembled with black installation wire (VDE 750 1.5 mm²) did well. It can then be made by everyone (DIY) without the necessary measuring equipment. If 16 turns are wound tightly, it resonates in the 7 - 7.2 MHz range with a 100 pF capacitor. 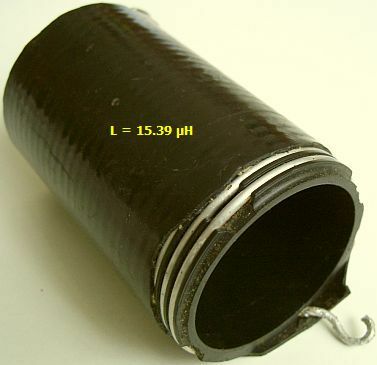 The 49 mm long coil is wound on a standard thick-walled PVC tube with a diameter of 32 mm. With my Russian 100 pF capacitor the resonance was circa 7.2 MHz..
Easy to construct solid traps made of standard PVC material. Trap frequency ≈ 7.2 MHz with 16 turns and 100 pF. The images clearly show how my practical model was made. 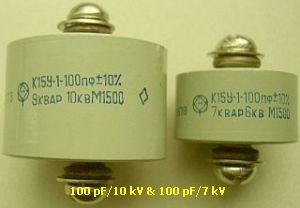 The capacitor is a Russian 100 pF/10 kV type that still are offered on flea markets or a usable smaller type 100 pF/7 kV. 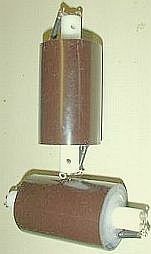 The enclosure is made of PVC pipe with two lids. 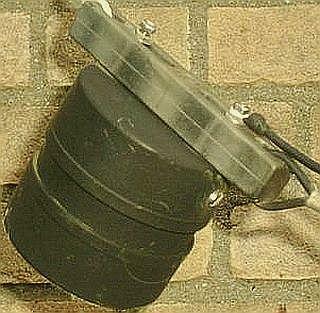 The trap is glued at the upper lid with special HARD PVC GLUE and the wire ends are attached to a (Fritzel) insulator with two stainless steel bolts. The bolts are also connection points for the antenna. The bottom lid is glued to the pipe. The latter is attached to the upper lid with two stainless steel parkers. One of the parkers is just visible on the top image. This creates a drip-water-tight construction that can be quickly disassembled for inspection and cleaning. The exterior is painted with black "bumper paint" for plastic car bumpers and that is a very good weather-resistant treatment. 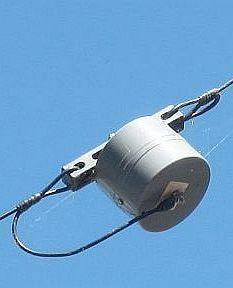 An antenna always sags and the container has a lop-sided position. In the lowest point a 4 mm hole was drilled in the bottom lid close to the edge to drain condensation water. At first without hole it turned out that after some time an fair amount of water was collected. Unfortunately, the small hole is big enough to offer all kinds of insects a safe shelter!(«fig). A regularly 'insect' inspection is recommended. PAØHRA has made these wave traps (fig») with a type of 'ton' cap used by many hams. This model usually has a working voltage of about 1000 V. For an ouput power of up to 400 W, it seems okay to me, but for more power it is better to install a type with a higher working voltage. 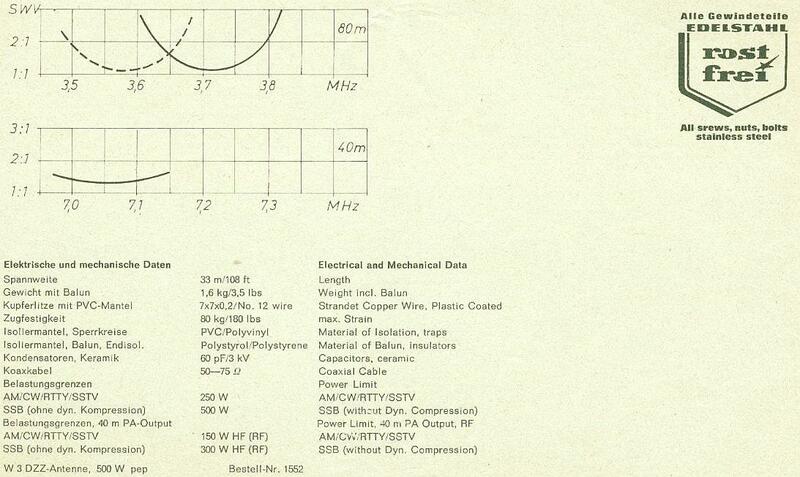 Also circa 1 m coax cable (Vf = 0.66) is suitable as 100 pF capacitance for about 1 kW. In experiments, my DIY traps were regularly loaded with about 800 W without any adverse effect on the entire construction, see the relefante images. Probably the traps are suited for more power because for the umpteenth time it was tested with 1.5 kW. 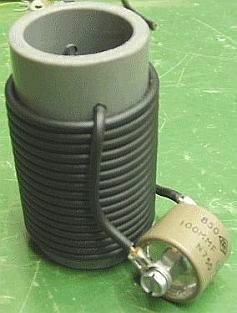 The coil form glued to the housing had apparently become loose, so that the distance between capacitor and coil had become too small. During years 100 W transmitter ouput was no problem because I almost always work with that power. When testing an ACOM 600S amplifier, the protection of the PA was activated with circa 300 W on 40 m. On the other bands the PA works falwless with 500 W to the W3DZZ. Because at 40 m the impedance at the beginning of the ribbon line is high, at first the static protection with two spark plugs was suspected. However, it turned out to be one of the 40 m traps. Considering the damage to coil and capacitor you can see how high voltages in a trap occurs. Because the trap dipole was fed with an open line, the dimensions were not so critical for me. 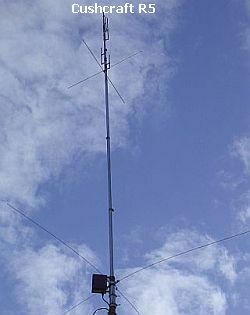 For your information: the antenna was used as inverted V on a 12 m mast. The wires were 2 × 10.6 m (½ λ on 40m) and 2 × 6.7 m. In my backyard was too little space and therefore a part of a the dipole was extended with a rolled ribbon line (stub). With a symmetrical tuner the antenna system was matched on all 9 HF bands. 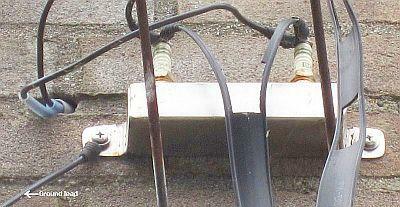 In the past 38 years many wire antennas were tested in my property. At present (July 2018) the W3DZZ is back again. The rolled stub was removed and one end of the too short dipole is extended with a 4.10 m long vertical Alu rod. This 2 × 16.55 m dipole is the maximum that is achievable in the available space around my house! The optimal available space used with a dipole in the same plane. Nowadays I am mainly active on 160, 80, 40 and 20m. To have some 'gain' on the last band, the 40 m traps have been replaced by 20 m traps. Consequently the antenna between the traps became a full wave (FW) dipole on 20 m. That should yield about 2dB more improvement than a half wave dipole. If that in practice is true for an inverted V system is still the question. 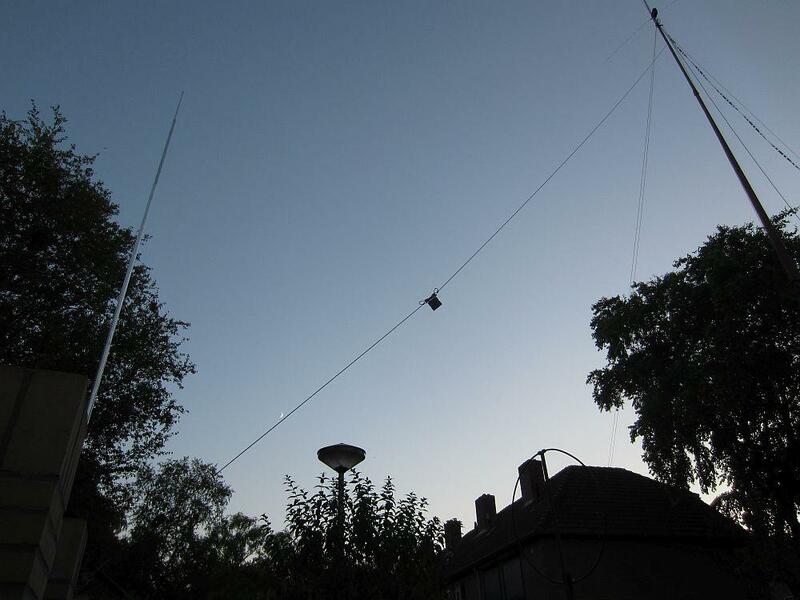 On top of the 12 m mast where this antenna is suspended, a 5 m long Cushcraft R5 (fig») vertical is mounted. On the 20 m band the antenna is a shortened antenna with a 20 m trap. It turns out that for DX and Europe traffic the 20 m full wave antenna is on average better or as good as the R5! 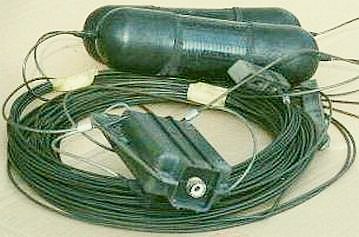 14.5 MHz trap with 27 pF cap: 1.8 mm diameter wire, 15 turns staggered windings on 3.2 cm diameter PVC tube. I had a spool with 1.8 mm enamel wire in my junkbox, so two air-wound coils with 15 staggered windings were made on a 3.2 cm PVC tube. A 14.7 MHz frequency was set by pressing and spreading the windings. During the measurement, long wires were still connected to the coil, but after shortening the resonance shifted to 14.5 MHz. That is a good compromise for a 20 m trap. Then the windings were fixed with BISON POLYMAX adhesive. This product glues almost everything, is strong and HF neutral, remains somewhat flexible, is weather-resistant and suitable from -40ºC to + 100ºC. You can also use Hard PVC glue for fixing. To be sure, I also applied heat shrink tubing and then mounted the complete traps in the housing (fig») of the removed 40 m traps. 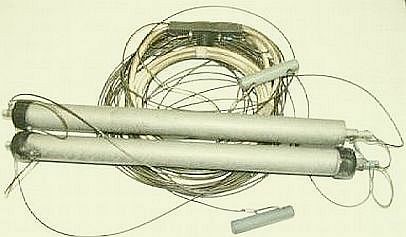 Hams have often tried, by changing antenna lenghts and traps, to design an antenna that would resonate on more than two bands. 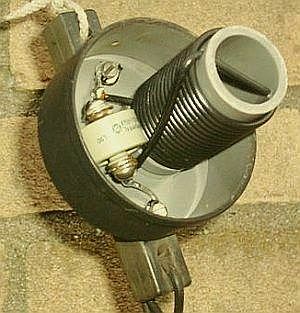 You can experiment for your version or for example start with G3SYD's antenna. Read possibly my article Dipool. 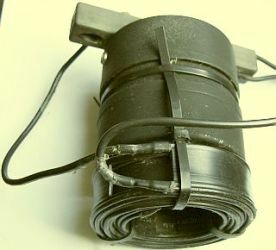 Published lengths do not mentioned whether the dimension applies to the wire (L3) between balun and trap, between trap and insulator and whether the folded pieces (L1, L2) form part of the specified size. Furthermore, it is important whether uninsulated or insulated wire was used. In the latter case I calculate with a velocity factor of V = 0.95. Note: The velocity factor for a trap antenna with non-insulated wire only applies to the wire between trap and insulator and not to the part between balun and trap. if insulated wire is used, see the info of image above. W8NX's developed an antenna for the American frequency segments 3.5 - 4.0 MHz and 7.0 - 7.3 MHz, 18 MHz and 28 MHz. The special feature of the design is another location of the traps tuned to 5.16 MHz ± 25 kHz. A low SWR was at 3.8, 7.12, and 28.4 MHz and SWR = 3 over the entire 17 m band. The antenna was suspended as inverted V and fed with 75 Ω coaxial cable and a 50 : 75 Ω balun. According to him, the antenna also worked with 50 Ω coaxial cable and 1 ÷ 1 balun, but with the aforementioned matching the SWR was better at 18 and 28 MHz. Note: Strictly speaking, are the dipoles of W8NX and ON5CVD not trap antennas. The 'traps' do not resonate on an amateur band, but are mounted in the system so that the antenna can be fed with a coaxial cable. If you use an open wire feeder you can without adverse consequences remove the 'traps'. The antenna will work (perhaps better) as 'normal' all-band dipole (doublet). Because a W8NX is even shorter than a G5RV, the latter probably will be favorite. PAØFRI: The adjustment or checking resonance of a trap can be done in different ways: with a (grid)dipper, spectrum analyzer or signal generator. The disadvantage of a dipper is that the scale is generally not accurate, so the frequency has to be checked with a receiver. Not everyone does have an analyzer or signal generator. Fortunately, the transmitter can be used as signal generator as UR4LRG did. 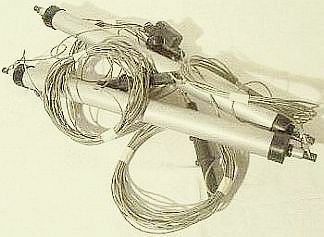 A coax cable with a coupling loop of 1 or 2 turns, 50 mm diameter, is connected to the transmitter and drived with the lowest possible power. 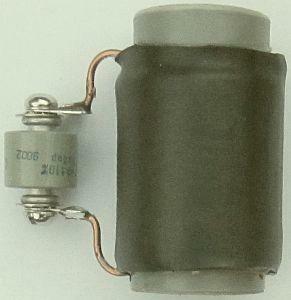 More correctly an induction-free 50 Ohm resistor can be installed in series with the coupling for a proper load of the transmitter. In the field-strenght meter you may use BAT85 or gemanium diodes instead of the Russian germanium diodes. It is highly desirable to check the thermal stability of ready traps. Place them in the freezer compartment of a refrigerator for 8-10 hours. After that, they must be removed and immediately check the resonance frequency. It should remain within the range of 20 kHz. 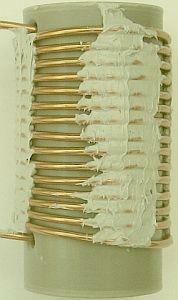 After heating cool the traps down to room temperature, their frequency should return to original frequency'. 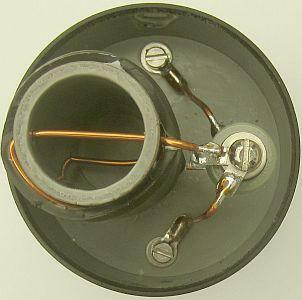 In addition to the traps described, experiments were also made with traps made of a length coax cable, where the cable is both 'inductance' and 'capacitance'. 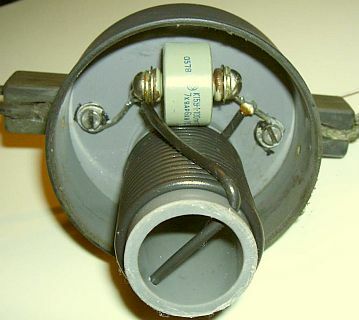 Usually the coax cable is wrapped around a coil base or PVC pipe, but not everyone knows that there are several possibilities to connect the traps in the antenna system. 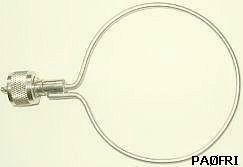 Furthermore, the coaxial cable can also be assembled as a multiple winding (fig»). 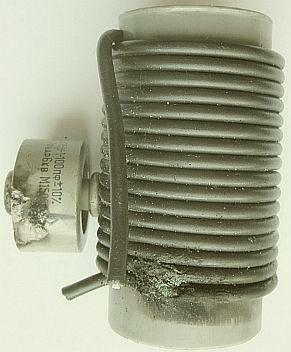 A coil base is not necessary, so that the complete trap becomes much lighter as can be seen on R3RT's website. 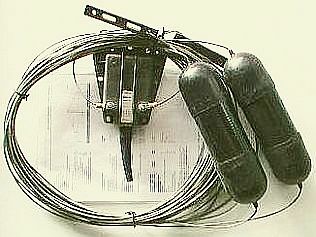 With this coax trap system, the length of the coaxial cable largely determines the resonance while the number of turns increases the velocity factor. For one of my experiments, a random piece of Teflon 50 Ohm coax cable of about 104 cm was tested with a RIGOL antenna analyzer. You can see that the resonances are quite close to each other despite differences in the connection. Also because the length largely determines the resonance, my modest opinion is that: it is more a coaxial stub than a coil-capacitor system. The conventional method gives the best dip, presumably by the best Q of the trap. Intuitively I prefer the third pictured method. 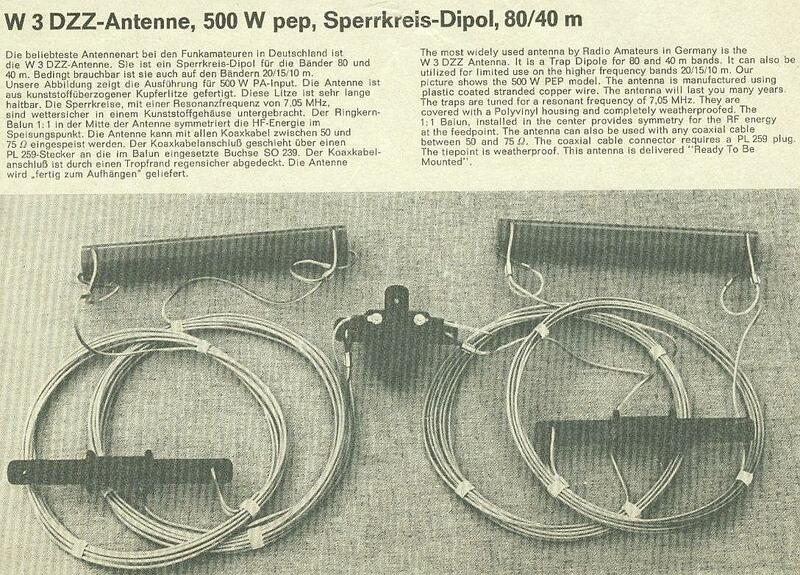 Fritzel (SK) produced antennas with two types of traps. Top left the old type with a balun of white coax cable and top right with a toroid balun. On the bottom images of the antenna with a newer model balun series 83. 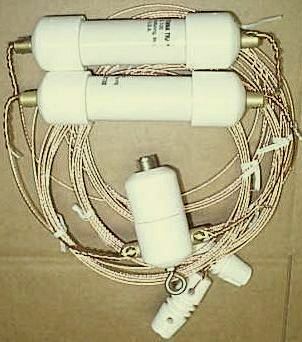 The wave traps and balun are suitable for higher transmission power. 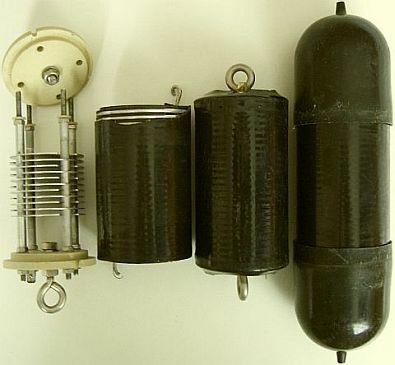 In the course of time a number of FRITZEL traps were "collected" and so it was possible to investigate the construction and value of the components. Left: the construction and manufacture of an original FRITZEL trap; right: a complete trap without caps. The measured values of the components bare on the table. 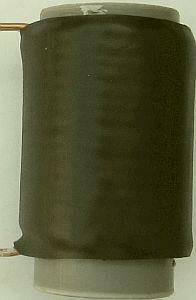 The coil is made with aluminum wire wound on a black plastic coil with grooves. Everything is covered with heat shrink. 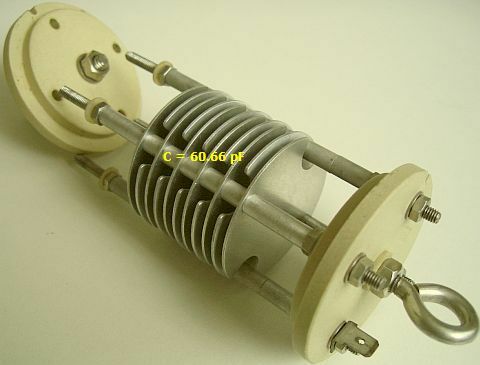 Inside the form is a beautiful plate capacitor with air insulation. 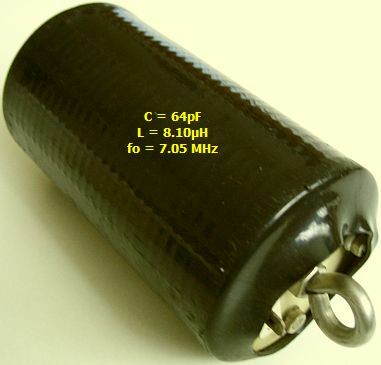 The capacity of the capacitor outside the tube was C = 60.6 pF and in the tube C = 64 pF. 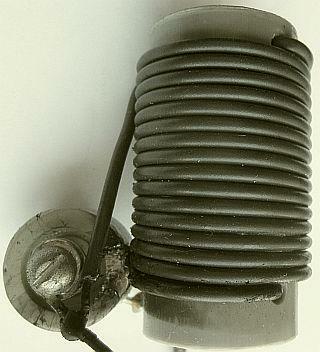 The bare inductance of the coil was L = 15.39 μH and with placed capacitor L = 8.10 μH. The resonant frequency of the complete trap was fo = 7.05 MHz. The caps should keep it waterproof but will not protect in the long run. Due to the penetration of moisture, the capacitor and aluminum wire sometimes oxidise substantial, which in turn changes the resonance frequency. 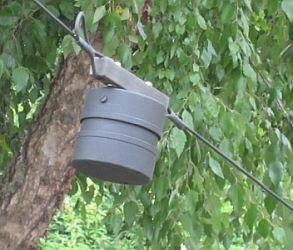 In order to improve things, the plan was to mount the traps in a gray PVC pipe with lids. 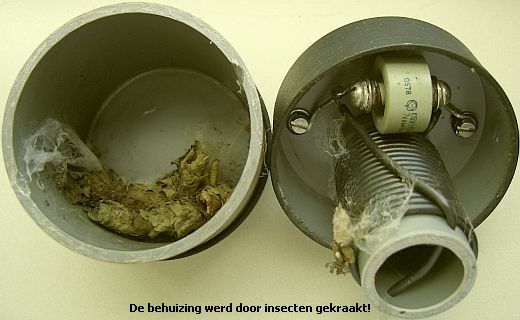 The FRITZEL traps were not (yet) used, because my DIY ones did their job well in practice. These two antennas are respective of German and American origin. 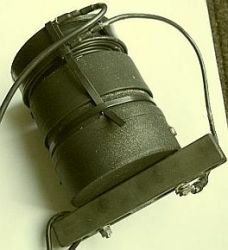 The last one is a B & W type, model AS-40 for 10/15/20/40 m.
This is another German product with molded traps..
Ready-made traps are often offered in England, USA and Germany. 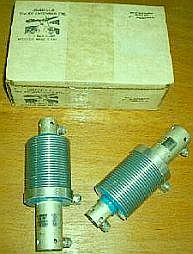 Left: a German make, middle: type KW-40, Unidella in the USA, right: German traps made of 50 Ω RG58 coaxial cable. In the last construction, the coil is a moulded-in coax cable and the cable capacitance acts as a capacitor. Because the LC ratio is different than in the original W3DZZ design, the antenna will only resonate in the 40 and 80 m band and the dimensions of the dipole can deviate from the original W3DZZ.